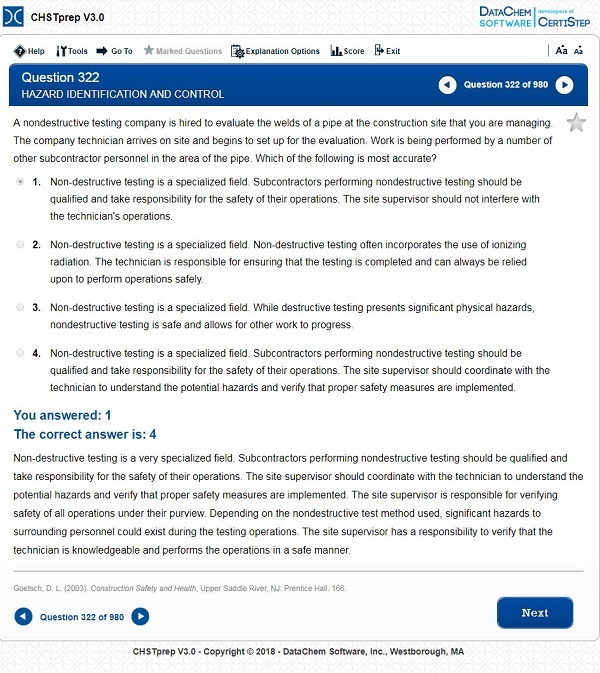 The software is designed to prepare the user for the Construction Health and Safety Technician (Version 4) certification exam that is offered by the Board of Certified Safety Professionals (BCSP). If you sit for the CHST exam after November 25, 2018 you will take the Version 4 exam which aligns with the CHSTprep V3.0. If you sit for the CHST exam before November 26, 2018 contact DataChem (1-800-377-9717) for our CHSTprep V 2.0 which aligns with this exam. CHSTprep V3.0 is currently authored by Phillip J. Nessler, Jr., a licensed Professional Engineer and Certified Safety Professional. Mr. Nessler obtained a B.S. in Safety Engineering from Texas A&M University and a M.S. in Civil and Environmental Engineering from George Washington University.